Acis, Agapanthus, Allium, Amaryllis, Ammocharis, Apodolirion, Boophone, Brodiaea, Brunsvigia, Caliphruria, Calostemma, Castellanoa, Cearanthes, Chlidanthus, Clinanthus, Clivia, Crinum, Crossyne, Cryptostephanus, Cyrtanthus, Diphalangium, Eithea, Eucharis, Eucrosia, Eustephia, Galanthus, Gethyllis, Gilliesia, Griffinia, Habranthus, Haemanthus, Hannonia, Hessea, Hieronymiella, Hippeastrum, Hymenocallis, Ipheion, Ismene, Leptochiton, Leucocoryne, Leucojum, Lycoris, Mathieua, Miersia, Namaquanula, Narcissus, Nerine, Nothoscordum, Pabellonia, Pamianthe, Pancratium, Paramongaia, Phaedranassa, Phycella, Placea, Plagiolirion, Proiphys, Prototulbaghia, Pyrolirion, Rauhia, Rhodophiala, Scadoxus, Solaria, Speea, Sprekelia, Stenomesson, Sternbergia, Strumaria, Tocantinia, Traubia, Trichlora, Tristagma, Tulbaghia, Ungernia, Urceolina, Vagaria, Worsleya, Zephyranthes. They are herbaceous plants, typically bulbous, although there are some species with rhizomes or with short rhizomes emerging from the base of the bulb. During the adverse station they lose the stem and the leaves and take cover underground in order to be safe from the cold or from the drought. Afterwards, as soon as the station becomes favourable, they stick their flowers out in a record time. That is the case, for example, of the Snowdrop (Galanthus nivalis) in Europe or the Haemanthus coccineus in South Africa. 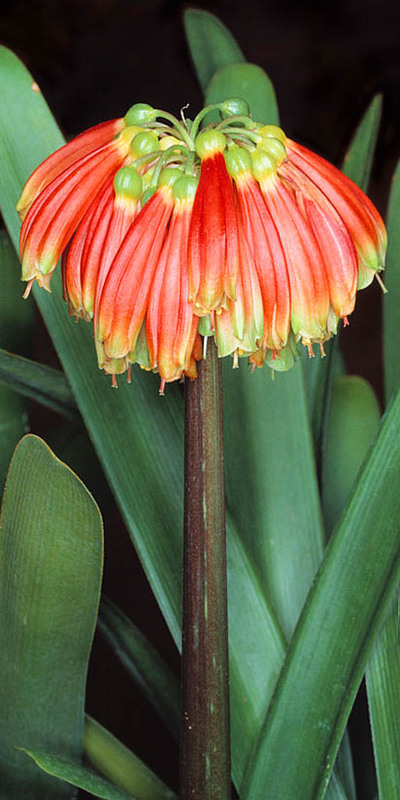 On the contrary, the well known Clivia miniata, one of the rhizomatous species, is a plant for all the stations: an evergreen which is very appreciated in the Mediterranean gardens because of its spectacular, spring-aestival inflorescences and the large red berries that peep between the elegant, ribbon-like foliage during winter. The hermaphrodite structure of the flower follows a ternary formula: two whorls (elements inserted on the same plane) compound by 3 pieces each that form the corolla, 3 carpels (modified leaves protecting the feminine part of the flower) with 3 locules for the ovules, and two groups of 3 stamens (differentiating this family from the similar Iridaceae which only bear 3 stamens) and an inferior ovary (fact that distinguishes the Amaryllidaceae from the Liliaceae that show a superior ovary). In some species, such as those from the genera Hymenocallis, Narcissus and Pancratium, a petaloid structure, fused or free, known as paracorolla or corona, can be noted in the centre of the corolla, building the trumpet-shaped extension of the well known daffodils. 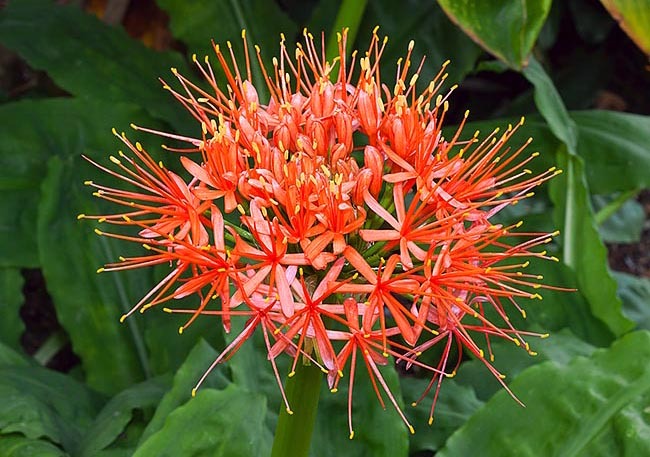 The flowers can be isolated or reunited in spectacular inflorescences. The pollination is carried out by insects and birds. The seeds can be very large, like those of the genus Crinum, in which they have a tuberous shape, rich in endosperm, also known as albumen (the nutritive tissue for the embryo), but most of the time the Amaryllidaceae are plants that use vegetative multiplication to propagate through bulbils that develop next to the main bulb or even in the flower’s position. It is not necessary to mention that it is a family with a great importance for mankind: think of the Garlic (Allium sativum) of usual utilization in cuisine, with uncountable medicinal properties or think of the flower business: who has not received as a gift a bouquet of daffodils or a pompous Hippeastrum ? → To appreciate the biodiversity within the AMARYLLIDACEAE family please click here.